You may be wondering, “why are we SO excited about mushrooms?” Well, our mushroom logs have finally fruited! 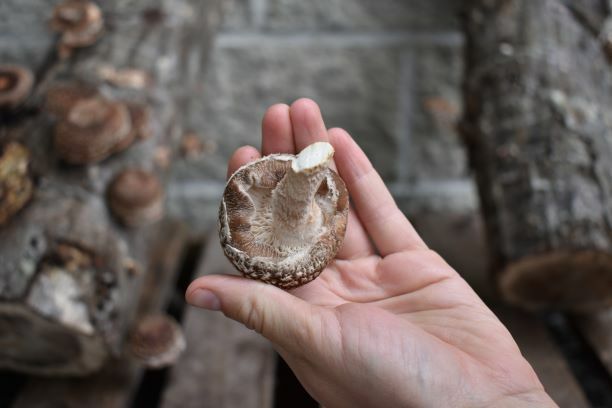 Over a year in the making, we have successfully grown edible shiitake mushrooms! 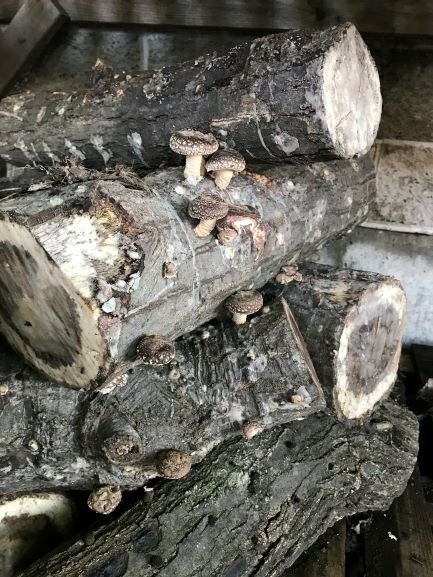 Last year, our horticulture team inoculated hardwood logs with shiitake plug spawn, and sealed them with food grade wax to retain moisture. The shiitake mycelium then colonized and “ate” the log. Once the mycelium ran out of “food,” it produced delicious mushrooms for us to enjoy! Now that these have fruited, they will continue to fruit for about 3 to 5 more years. Growing shiitake mushrooms is an excellent way to incorporate small, less utilized spaces into your garden. The logs do not require much sunlight, nor a lot of maintenance (they only need about an inch of water per week). If no shade is available, do not fear! Our shade cloth canopy will protect the logs from harsh sun. You can choose set ups from logs with or without a pallet base, an A-frame stand or a shade canopy. By “force” fruiting at the proper time, you can even encourage earlier harvests. We also offer wine cap mushrooms! These are grown in a cedar raised bed with irrigation, or alongside your perennial in-ground garden. Instead of the fungi mycelium being inoculated into a log, it is inoculated into wood chips. This vegetative portion of the fungus “eats” the wood chips until it runs out of food, producing bountiful wine cap fruits ready to harvest. Still pondering growing your own? Think about all the cool things you can do with mushrooms! Saute, roast, bake, fry, braise, grill and caramelize them, or make entire dishes like mushroom burgers or mushroom soups. What about mushroom pizza and mushroom risotto?! Holy shiitake, the opportunities are endless! 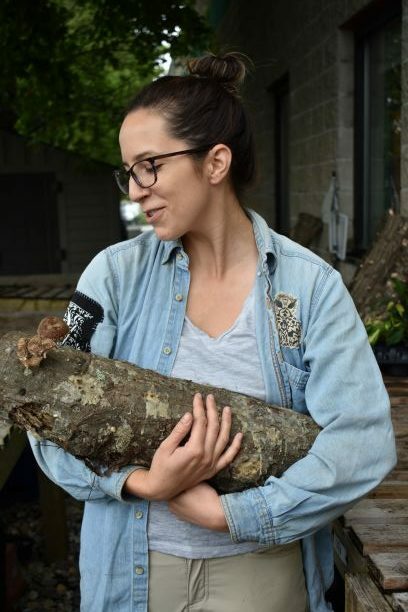 Now that our team has experimented and succeeded in growing mushrooms, we hope to make inoculated logs available for purchase next spring! Stay tuned for more updates and email us at info@greencitygrowers.com for more information!